This is how you get from a military training announced in a press release to being terrified in one easy step. I live down the road a piece from Victoria, Texas. I have lots of friends in Victoria, including the one who sent me this warning from the front page of her local newspaper, The Victoria Advocate. The fears swirl around the release of an unclassified document that outlines a realistic military training set to take place this summer in Goliad, Victoria and other places across the country. Some have speculated the exercise is the first step toward martial law, an extreme and rare measure used to control society during war and periods of unrest. Martial law! Good Lord, people, there are about 2,000 brave souls living in Goliad and they can’t do this on their own. According to the training map, Texas is marked in red. According to the newspaper, there’s a reason for that. Because Texas – one of seven states involved – was marked red and labeled hostile in the document, theorists have postulated it was targeted because of its stigma of being friendly to guns, among other reasons. And that, my friends, is how you get from a military training announced in a press release to being terrified in one easy step. 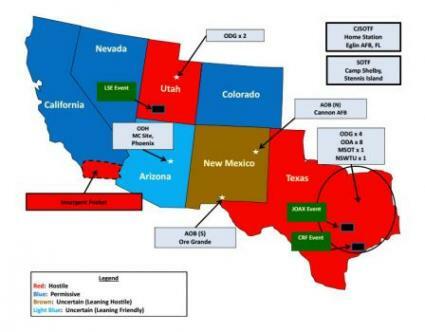 Operation Jade Helm’s press release with Texas in red. Apparently this is a thing because if you go to Google and search “Jade Helm 15” the crazies will crawl all over your computer screen.